It’s more beautiful than you ever expected. Nachi Falls tumbles over two rocks in the Kii Mountains. It’s the tallest uninterrupted waterfall in Japan. A green cedar forest stands guard behind it. Kumano Nachi Taisha, a Shinto shrine, is perched in front of it. So is Seiganto-ji (the Temple of the Blue Waves), a Tendai Buddhist temple, and the sacred camphor tree, which you can enter to make offerings at its altar. It’s hard not to believe that there’s a higher power at work here. You’re on the Nakahechi Route. It’s one of the trails in Kumano Kodō, an area known for Kumano Sanzan (the three Grand Shrines of Kumano) and its physical healing abilities. No one is certain when the Kii Peninsula gained its religious significance, though. It definitely predates all modern religions. Members of the Imperial Family started venturing here in the 11th century. Commoners followed by the 15th century. It’s now one of the most famous pilgrimage routes, along with the Camino de Santiago, in the world and a UNESCO World Heritage Site. Like the Camino de Santiago, Kumano Kodō is not an easy undertaking. The three shrines are located 20-40 kilometers from one another. It can take days to reach a single shrine on the moss-covered stone paths. 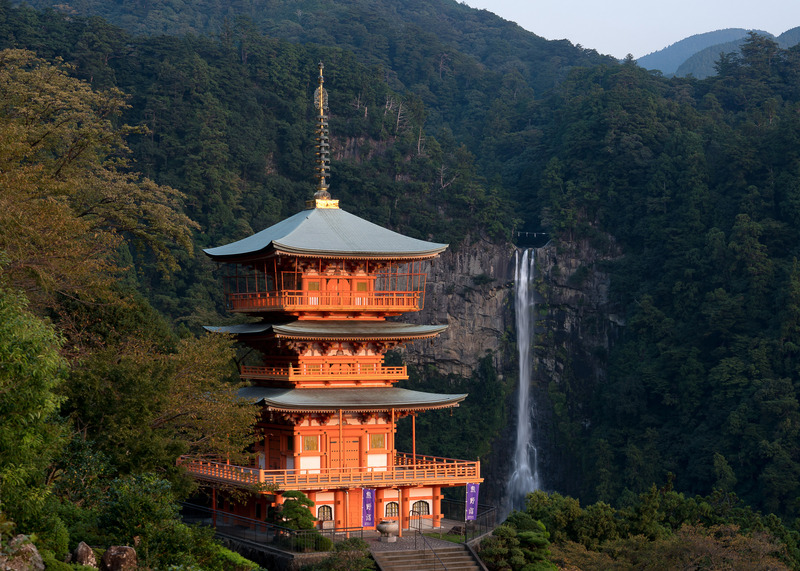 Temples, waterfalls, and even ancient trees only delay you, as they veer off the steep trails in between them. Nearly constant rainfall, thanks to the Kuroshio current, doesn’t help either. Thankfully, there are small, well-preserved Edo-era villages along the way. They offer ryokans and minshukus (guesthouses) so you don’t have to camp. Prepared lunch boxes mean you don’t have to lug much food around either. Hot springs and traditional Japanese baths relax sore muscles at the end of the day. Deer, monkeys, and, every once in a while, snakes, offer momentary distractions. Japanese bush warblers sing around you. While gorgeous views of the valley are never far from sight. So, are you ready to continue to Kumano Hayatama Taisha? It’s only 23 kilometers away. More stunning viewpoints, this time of the coastline, are promised along the way. I just can’t wait to get there! I’ll do this experience in july !